For a long time, the most noteworthy visual signature of The Glenrothes as a distillery was a lack of concrete age statements on their bottles. Sure, you could deduce the age of a given batch with a little bit of arithmetic, but the company sought to make its products distinctive by giving them “vintage year” titles, rather than the more classical (and ubiquitous) age statements. To be sure, it did help drive home the point of an older expression’s age—when you pick up a bottle that says “1999,” you can’t help but be reminded of how long ago that really was. Now, however, it would seem The Glenrothes has decided that it’s time for a change. The distillery is ditching its vintage statements and refreshing its marketing to a more approachable set of age statements, which are likewise meant to highlight the most important aspect of the distillery’s single malt maturation: The exclusive use of sherry-seasoned casks. Although many single malts from Scotland are finished in sherry casks, The Glenrothes is one of the only major distilleries to age their Speyside single malts in sherry-seasoned oak for the entire duration of maturation. Which is to say: The sherry is definitely meant to be felt here. The new Soleo Collection signals an evolution for the Glenrothes distillery from Reserves and Vintages to new age statements. This decision was not one that was taken lightly and the shift was driven by feedback from consumers and the trade and our pledge to continue to offer them our very best while making it easier to understand and navigate our range. In terms of ease of navigation, they’re correct—it’s certainly easier to look at a bottle that says “12-year-old” or “18-year-old” and have a good expectation of where it fits in the single malt landscape, compared to a vintage year. I also must confess that I love the simplicity and color-coding of the new Soleo Collection labels—combined with The Glenrothes distinctive bottles, it makes me want to have the entire collection in a row on my liquor cabinet. I’m not usually a sucker for design, but these colors speak to me for some reason. Anyway. Let’s get to tasting the lineup. Sadly, we didn’t have access to the ultimate The Glenrothes 25 Year Old, but we’ve got all the rest. This young Speyside single malt certainly isn’t lacking in character, although it’s not terribly complex. Unexpected florals on the nose slowly fade as it sits in the glass, revealing maple syrup-like sweetness. This is distinctly “biscuity” on the palate, like a shortbread cookie mixed with cream-of-wheat graininess, although there’s also some vinous fruit character that is slightly winey, along with green oak. Stone fruitiness, combined with that vinous character makes me think a tad of apricot brandy. As is common in Speyside whiskies, and this collection in general, don’t be expecting much peat and “smoke” to speak of, here. There’s some slight earthiness and hints of peat, but not that true “smoke” you get in more heavily peated single malts. Mild honey sweetness runs through this sample, however, which ultimately seems a tad hot for the proof. All in all, not bad, but something that will likely be preferred by whisky drinkers who like that biscuity sort of profile. Another 10 bucks on the shelf earns you another two years of age, but is that enough time to really make a difference? Well, as is so often the case, the answer is subjective. The Glenrothes 12 Year Old is certainly a similar liquid—there’s no quantum leap that happens here between 10 and 12, but there is a subtle evolution. On the nose you get more of that biscuity/shortbread/cookie character, but there’s a bit more suggestion of oak and caramelization as well. On the palate, this one strikes me as a bit more “malty,” in a toasted bread crust sort of way, with red apple fruitiness and a touch of cinnamon spice, supported by lemon and orange citrus. It drinks easily, and I should note that both this and the 10 Year are fairly dry—they’re certainly not the desserty drams you might expect after aging their whole lives in former sherry casks. Like the 10 Year, there’s no “smoke” to be found, but a bit of earthiness is there once again. It’s a bit more complex, composed version of the former, which makes for pleasant neat drinking. 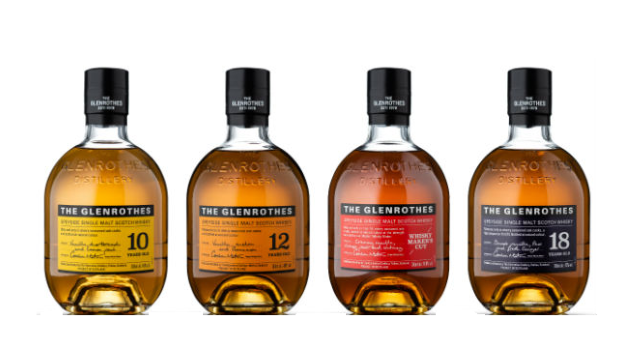 It initially seems a bit odd to have a non-age-statement, higher-proof expression of The Glenrothes in the middle of the new lineup when the main selling point of said lineup is the existence of the age statements, but tasting the Whisky Maker’s Cut quickly changed my mind. This is far and away the most unusual and distinctive of the bottles in the Soleo Collection, and its idiosyncrasies also ultimately made it my favorite. First of all, unlike all the other offerings in the line, the Whisky Maker’s Cut is made solely with liquid from first-fill sherry casks. Coupled with the increased proof, it transforms this spirit into something else entirely. Caramel, vanilla, cinnamon and stewed apples explode on the nose, along with buttered toast and roasted nuts. The palate is likewise intense, flavorful and memorable: Caramel-heavy, but still with a touch of dark honey, sweeter, with a long, lingering spice finish of cinnamon, nutmeg and orange essential oil. There’s also a much more pronounced “char” here as well—you’d almost think that some newly charred oak was involved, but I guess it’s just those fresher casks. I’ve often heard various single malt bottles of scotch described as being “the bourbon drinker’s scotch,” but I’ve never had one that so fit the bill as The Glenrothes Whisky Maker’s Cut. The richness, caramelization and spice profile form an extremely inviting bridge toward American whiskey drinkers, and I can see myself recommending this bottle toward all my bourbon drinking friends who want the same kind of richness (without the peaty assertiveness) in a scotch. Ultimately, this little sample was a wonderful surprise. The 18-year-old expression of The Glenrothes pushes us into some more rarefied, premium price tier air, although if you’re curious, the 25 Year Old carries a $500 price tag. So yeah—the 18 is probably the last you’ll be seeing on the shelf, rather than in a case under lock and key. This is the same single malt as the 10 or 12 Year, with still more age on it. You also get a little bump in the proof, up to 86 rather than 80. On the nose, more complexity has definitely developed here—I get honeycomb and rose petals in addition to the biscuity note that I now think of as The Glenrothes signature. There’s more overt oakiness here as well; a mix of old and younger oak, and a similar caramel note to the 12 Year Old. On the palate, this is quite smooth in texture, first sporting grainy flavors of malt and oatmeal, before distinctly landing on a sweet, fruity note of pear—like pears in syrup, really. There’s a bit more tannic quality of the oak, which contributes a balancing dryness, and some more peaty/earthy notes than in the younger expressions—grass and hay-like earthiness. It strikes me as just a tad sweeter than the 10 or 12 Year as well, likely owing to the higher proof. The alcohol, meanwhile, has been quite tamed by its long rest. Ultimately, this is pretty tasty, but I’m curious what it would be like if presented at something like the even higher proof found in the Whisky Maker’s Cut. Still, if you have the means and like sherried Speyside single malts, you’re not going to regret splurging on this dram.